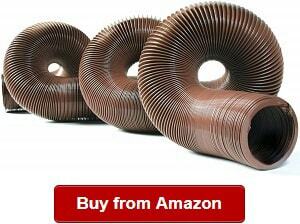 Any camper or outdoor enthusiast will know how important getting the best RV sewer hose is. The RV sewer hose or the stinky hose is a piece of equipment that can help clean out your dirty water and your waste materials wherever you go camping. 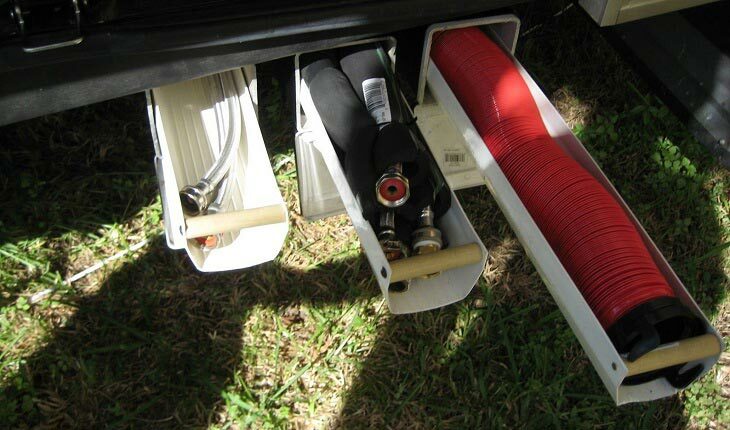 This hose can help you observe proper hygiene and also ensure that your camper won’t smell. 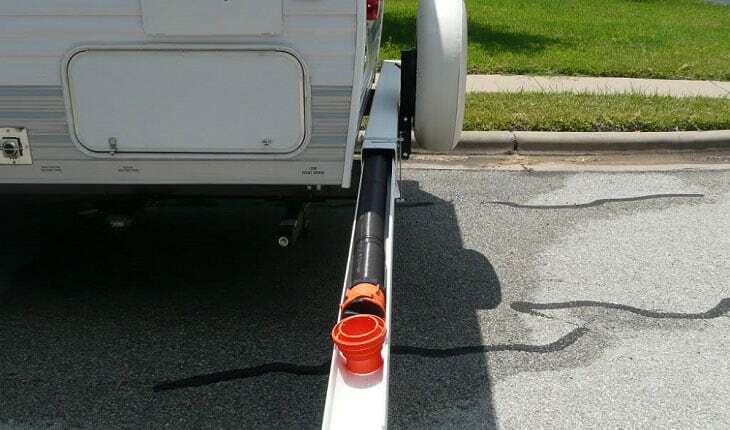 What the RV sewer hose extension does is that it connects the flush of your camper’s toilet to an external sewage system. So whenever you want to dispose of the waste, all you have to do is connect the hose to the main sewers. That way, you won’t have to manually dispose of your waste in a river or in the ground. However, the problem will arise if you don’t buy a quality hose. One leak and all your wastewater will seep out. That’s why you must always choose a high-quality RV sewer hose for your camper. This guide will give you an idea of the top hoses you can buy as well as provide you with a small buying guide. RhinoFLEX is definitely known for its toughness and durability—that’s why it’s the perfect RV sewer hose for me. We’re pretty rough campers who like to travel from one spot to another and we’re the type who don’t really have the patience to really take care of equipment. This is why we like this hose because it’s really rugged and durable. Whether it gets hit by stones or gets affected by bad weather, it’ll still stay right where it is. We don’t even have to bring it inside when there’s a strong rainstorm because it’s pretty much weatherproof. It’s made of very durable polyolefin materialf with steel wire making it have a stronger frame as compared to other brands of hoses. Another thing we like about it is that it’s extendable, so it’s not hard to store. While storing sewer hoses can be quite a drag because you have to fold it and stuff it into your closet or cabinet, we never have that problem with this one. While we can store it easily, we can also extend it to the length we want. It has a maximum length of 20 feet so we get to choose how far we want it extended. Overall, this is great for rough use and you don’t need to be very gentle with it. Aside from that, it’s also quite easy to set up and use. You won’t have any trouble with it other than the fact that it’s pretty bulky. We would say that this one is more for the extreme campers who like to set up camp in those really rugged areas such as near the mountainside or probably in the rainforests. More durable than the RhinoFLEX, the RhinoEXTREME has a special TPE technology that prevents scratches, holes, and overall impact. We’ve tried using it once on one of our camping trips and it didn’t disappoint. A few animals In the area even tried to chew on it but to no avail. It also comes with reusable locking rings and caps making it very easy to use and even customize the way you want it. Its locking system makes use of a swivel bayonet so that you can attach it without any trouble at all. Just like the RhinoFLEX, it’s also really long and can reach up to 20 feet in length. This makes you have a pretty safe distance away from the dumping station. Another great thing about the RhinoEXTREME is that it’s also rust proof. So you can throw water on it or leave it out in the rain without having to worry about it. Overall, it is the more durable version of the RhinoFLEX model. It may cost a bit more, but it’s more worth it to buy if you’re into more challenging landscapes. This is the lighter and less bulky alternative to the 20 feet RhinoFLEX RV Sewer hose. Just like the 20 feet variant, this one is also really durable but not as bulky because of its shorter length and its weight. What makes this one really good is that it can compress to 56 inches so that it’s easy for you to store in your home. Aside from that, it’s also quite lightweight sporting a total weight of 3 pounds, making it really easy for you to carry around. While we do prefer the 20-foot variant, we have friends who like using this 15-foot model because they find it easier to use. When we want camping with them, we understood what they meant. we do find the 15-foot variant a little bit easier to use than the 20-foot one because of its smaller structure. Aside from size, you’ll find that this hose has a removable 4 in 1 adapter and also makes use of 4 in 1 elbow adapter that can fit in dump station pipes of up to 4 inches. With regard to its durability, well it is made out of 23 mils of very sturdy polyolefin material with steel wire. One of our favorite things about this Camco sewer hose is that it’s really easy to store. This is because instead of being one whole hose, it’s actually two hoses that are 10 feet each and attachable to become 20 feet. So in essence, it’s actually a 20-foot hose that can be broken into two parts. For me, it’ll make things really easy for campers when it comes to storage because you can store one half if both can’t fit. Both of them can be compressed into 2 feet each to make it easier to keep. It’s also great for more absent minded people who tend to lose things. If ever you lose one of the hose, you can at least still use the other half for your camping trip while you look for the other half. Sure, it may be only 10 feet, but having 10 feet of the hose is better than having none—especially during a camping trip. Another great feature would be its swivel fittings. The swivel fittings are already attached when you buy the hose so all you have to do is attach the two halves to each other and attach each end to where they’re supposed to be. Also, these swivel fittings are new 360-degree swivel fittings making them much easier to use and a lot simpler to attach as compared to other brands. Finally, this hose is made out of pure vinyl material making it quite flexible. Since it’s flexible, you can put it in any position without worrying about it breaking. 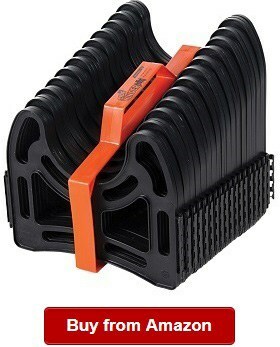 What makes this brand of sewer hose pretty unique is that it makes use of a UV stabilized poly construction design. This makes it protected from any leaks. We all know that leaks are the last thing that any camper would want in his or her sewer hose. I, for one, can’t imagine what would happen if our sewer hose would spring a leak and all the dirty water and wastes would spill out. That’s why we make sure we only buy top quality hoses that are leak-proof. With this brand, we’re sure of protection from leaks due to the UV stabilizing technology it uses. Other than the UV stabilizing technology it also has a 23 mil thickness making it even less susceptible to holes, scratches, and other abrasions that may possibly make the pipe spring a leak. In general, we find that this sewer hose is perfect if you’re the type of person who’s scared to get his or her hose punctured, scratched, or hit whenever he or she goes camping in the woods. Another thing to take note of would be its flexibility. 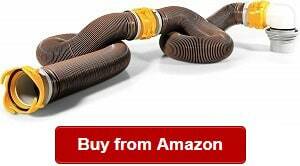 This is one of the most flexible hoses you’ll be able to find. It can flex all the way down to -30 degrees Fahrenheit. Yet another cool thing about it is that it can hold its shape even after you install it. When it comes to versatility, this is the good one to buy. It’s got an easy mount outlet and an Extended Grip bayonet fitting. This makes it really easy to set up and very easy to use as well. Because it makes use of a universal bayonet mount, it can fit pretty much any dump station plug. The bayonets are also designed to be easy to use so that even beginners won’t have a hard time using it. Another cool thing about this hose is that it makes use of a 5 in 1 sewer adapter instead of the usual 4 in 1 type that most sewer hoses use. The 5 in 1 feature makes it even easier to use and more flexible than other brands. You’ll also enjoy the durability of this hose. It has a TPE hose that ensures no leaks and no scratches are made to the hose. In fact, it’s even damage-proof even if a car runs over it. One other noteworthy feature is that it is temperature resistant meaning it can take even cold and hot temperatures. We tried to see if this works by heating up the hose a bit. It was able to withstand even strong heat without making a scratch. The Lippert sewer hose is a pretty useful hose that has a helical coil surrounding it. If you want a safe waste management system, this hose can give it to you. We liked the helical coil because it prevents the waste from leaking to the outside. To make it even more leak-proof, it comes with a CAM lock connector that makes sure that the connection to the sewage outlet is completely secure. While it’s rough on the outside, it’s very smooth on the inside. The smooth texture allows the waste to flow consistently through the hose without anything getting stuck. Another thing that you’ll like about this hose is that it can be compressed to up to 5 feet but can extend to 20 feet. Unlike a lot of other brands, this hose does not recoil when you extend it. It has a special mechanism that allows it to stay in place when you extend it. For me, that’s a really useful feature that can avoid a lot of hassles. Lastly, it comes with a discharge port that is very flexible and can flex itself up to 90 degrees. This makes it very easy for you to fit it into a sewage outlet. You’ll also find that the nozzle that carries the discharge port is very user-friendly so you won’t have a hard time figuring out how to maneuver it. Most sewer hoses that are made out of vinyl are known to be pretty fragile because vinyl isn’t really known to be a heavy duty, tough piece of material. However, this specific Camco model is one of the sturdiest vinyl sewer hoses you’ll find anywhere. That’s why it’s considered a heavy duty sewer house. 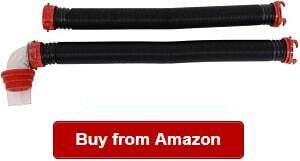 This hose is made out of 15 mils of strong vinyl making it ideal for any seasoned camper. In fact, it contains 25% more vinyl than all the other vinyl hoses you’ll find in the market. While it can stretch itself up to 20 feet, it can also compress itself to 32 inches so that you won’t have a hard time storing it away. It’s also really lightweight, only weighing 3.2 pounds so you won’t have a hard time carrying it. It also comes in variants of 20 feet, 15 feet, and 10 feet so you can choose how long you want your hose to be. 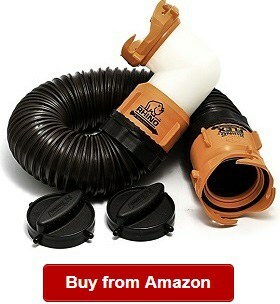 This is yet another RhinoFLEX sewer hose kit that doesn’t disappoint. The exception is that this one is designed for portable tote tanks making it easy to dump waste. So if you happen to be using a portable waste tank in your camper, you can use this one instead of a long heavy duty one. This one is about 3 feet long but can be compressed to a smaller size of 19 inches so that you can store it away easily. Even if it is used for a portable tote tank, it’s still really easy to use. It comes with bayonet fittings swivel that is very easy to connect to the outlets. It also has a 90-degree elbow so that you can easily make the waste flow through it without any obstruction. With this, you won’t have to worry about any waste getting stuck somewhere in the pipe. If we’re talking about durability, then you’ll love the UV stabilized resin covering on the hose. This covering allows the hose to last long years even if it is used most of the time. Aside from that, it’s also made out of heavy duty polyolefin and steel wire. Overall, this ensures its complete durability and long shelf life. This may not be an RV sewer hose but it’s definitely a great accessory to have. It’s a 15 feet Sidewinder RV Sewer Hose Support device that’s used for lifting the sewer hose up. 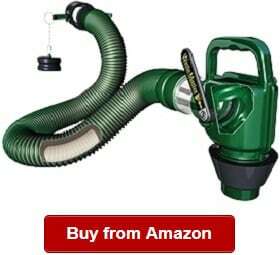 We have been using one for our RhinoFLEX sewer hose for whenever we go camping because it helps protect our hose. 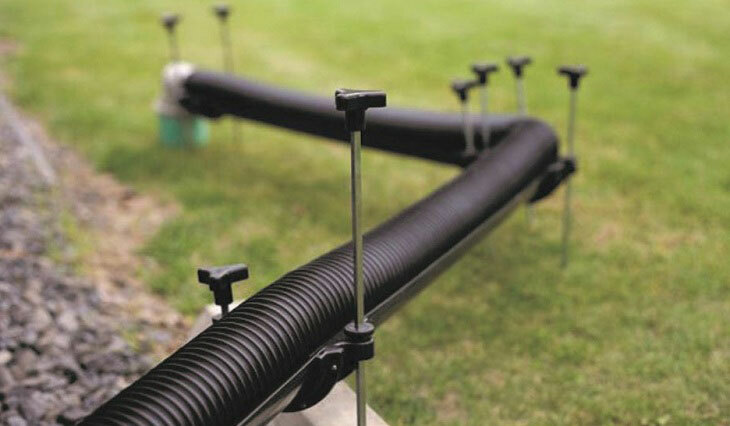 Since the support device keeps the sewer hose off the ground, it can also prevent the hose from having any punctures from sharp objects on the ground. Another thing that it does is that it tilts the hose a little bit so that the flow of waste through the pipe can be supported as well. It allows the pipe to get an angle of up to 7.25 inches. You can get to choose what angle you want the tilt to be. We usually choose the highest angle to have the best waste flow. What we love about this accessory is that it’s so easy to set up and so easy to use. We don’t need any manual or instructions to do so. We just have to clip on the hose to the device and it’s already attached. Since it’s made out of durable plastic, it’s weatherproof, rustproof, and corrosion proof. SmartRVing.net is your one-stop source of guides and reviews essential for RVing. We feature buying guides and reviews that will help you pick the right product for your needs. These reviews are created by real RVers that have years of combined experience in RV living and camping. With our real RV experience, we’re able to use different recreational vehicle accessories, gears, appliances and equipment. Using our knowledge in the RVing world and using different products for the camper, travel trailer or RV, we’re also able to factor in the most important considerations when picking an RV sewer hose. In the first section, we gave an idea as to what an RV sewer hose is and how one can use it. In this section, we’ll go into a more detailed description of what an RV sewer hose is and how it works. 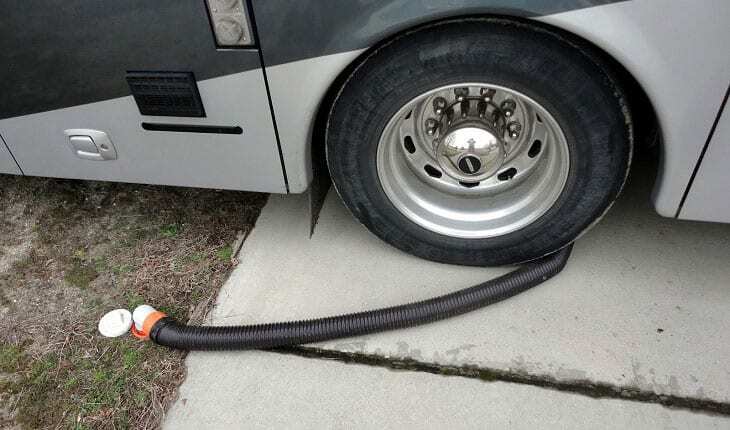 We’ve already mentioned above that the RV sewer hose connects the internal drainage and waste management system of your camper to the external sewage system. This allows you to clean your waste easily without having to keep them there for days. The hose is connected to a tank where all the waste and black water is stored. With enough pressure, you can use the hose to push out all of the wastewater into the tank that leads to the external sewage system. It’s very important to take note that the hose must always be maintained so that it won’t leak or rust. Once it rusts, the water inside could possibly be contaminated. So with that said, let’s go on to the benefits that you can get if you have a good hose as part of your RV waste master system. 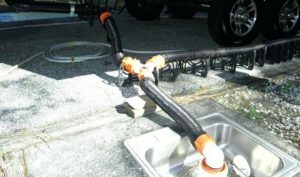 The RV drain hose or sewer hose works by helping owners empty or drain the sewer to keep the hygiene and comfort in their recreational vehicle. With its correct thickness, it can help you get more of it. 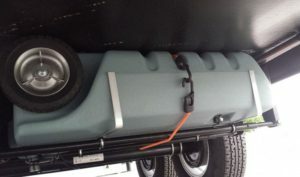 The RV sewer hose is also easy to store in the bumper storage, depending on your rig. Nevertheless, an RV sewer hose is one of the things you need for your RV, as it can help in keeping the RV clean and hygienic. RV sewer hoses work basically in the same manner. This stinky hose can help us clean out the waste materials and dirty water wherever we camp. With it, we can be certain that our rig won’t smell and that we can have good hygiene onboard. RV sewer hoses are great investments because they are designed and constructed to last long because of their ideal thickness. Their length, however, varies. That’s why when buying an RV sewer hose, you should compare your options and pick the right one based on the length you want it to have. You must also pick based on how frequent you want to use it, how easy it is to install and how convenient it is to store. Begin the selection process using our buying guide and top picks on the types of RV sewer hoses. When you go camping, one of the worst things to do is waste disposal. Most campers would usually store the waste inside a waste tank which they have disposed of later manually. This is honestly really disgusting but it has to be done. We ourself don’t like manual waste disposal so weprefer using a hose to transfer our waste directly to the external sewage system. Every camper knows that it’s bad to keep waste inside the waste tank for too long because it’s going to smell. Other than that, it’s really bad for hygiene. 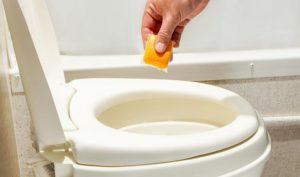 So by doing this, you will not only be reducing the amount of stink in your camper, but you’ll also stop the spread of certain bacteria and pathogens that can flood the air through the wastes. 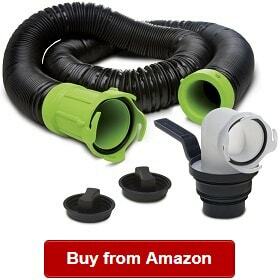 These RV sewer hose fittings are really reliable as they work really well. These hoses are also quite durable and long lasting depending on how you maintain them. That said, you really have to make sure that you take good care of them so that they won’t break or have a hole in them. That would be a big problem if they do. These hoses are actually very affordable! Not only are they affordable, but they’re functional and well worth your money. 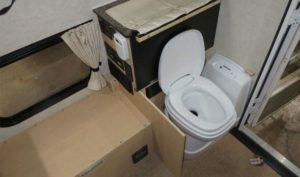 They can give you complete convenience for your waste management at a rather cheap price. The ones that we’ve mentioned above are not the cheapest in the market but they’re very reasonably priced considering their quality. Honestly, it’s much easier to use than most people think. Actually, it’s even harder to manually dispose of the waste from the tank. All you have to do is connect the hose to the waste tank and attach the other end to an external sewage system. There are valves there that you can easily control to make things easier for you. These hoses also come with manuals and detailed instructions making it very easy for you to use. Although we already provided you with a list of the top RV hoses that we think are the best, you still have to choose one of them to attach to your camper. Of course, not all of them will be suitable so you have to know what’s the best RV sewer hose kits for you. However, you won’t be able to choose the one most suited for you if you don’t know what you’re looking for. In this buying guide, we’ll list some of the factors that you have to consider when buying an RV sewer hose. You can use these factors when picking which of the choices is the best one. The first thing that you have to take note of would be the length of the hose. A hose with a good length can reach external sewage systems even far away. Longer ones are ideal if you don’t want to stay so close the sewage. The best RV sewer hose length is around 14 to up to 20 feet long. This length is enough to reach quite far and puts a distance between your camper and the sewage system. The girth is also very important because the thickness will determine how much you can use the hose and how long it will last. Obviously, you’ll need a thicker hose if you’re a heavy user. The ideal girth of RV sewer hoses is around 23 millimeters. Another thing that you have to think about would be the storage space needed for the hose. If your camper has a big storage area, you can buy a bulky hose, but if not, then you’ll either need a smaller hose or a compressible one. There are hoses that can be compressed to a small size so that it can fit the storage space even if it’s big. You will also want a hose that is flexible – especially if you move around a lot. The problem with a rigid hose is that it might break if you move it around too much. That is why you’ll want to check how flexible your hose is before you buy it. Flow consistency is really important for when you choose an RV sewage hose because you won’t want it to clog. The best way to determine the flow consistency would be by determining how big the diameter or the hole of the hose is. 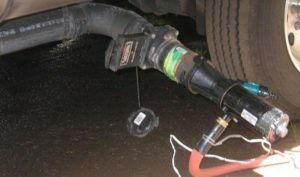 An ideal hole size for most hoses is 4×4 inches. This size can induce good flowing of waste so the hose won’t get stuck. You must also think about the cost of hose. You won’t want to buy one that is too cheap because it might break and spill all your wastewater around your camper. Of course, you also wouldn’t want to buy one that’s too expensive either because it’ll be too hard on your wallet. The ideal price range for these hoses is around $40 to$150 a hose. Most of the ones that we’ve mentioned above are around this price so you can use this range as a benchmark. Our reviewers have picked the high quality RV sewer hoses to help you compare and weigh your options well. They’ve looked into the factors to consider just as when buying a sewer hose for your RV. With our buying guide, you can gain a better idea on how to pick the sewer hose with the quality, durability, ease of use and price that is right for you. Trusting us, you can also have peace of mind that you’re picking the RV sewer hose based on the buying guide on what to know about sewer hoses and the best picks in the category. We do hope we’ve enlightened you on how to pick a sewer hose for your needs today! Q: How long can RV sewer hose be? 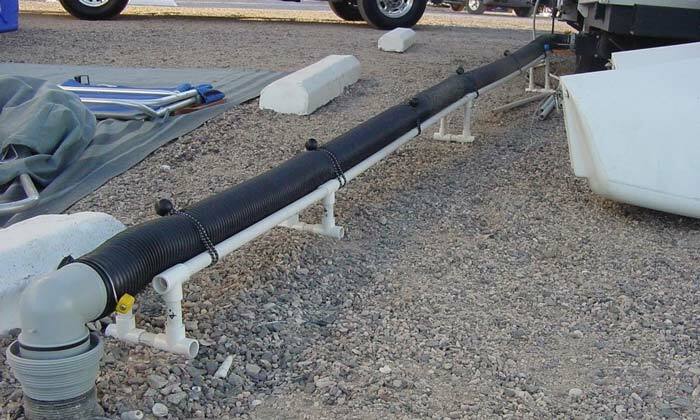 A: The average RV sewage hose length would reach up to 14 or15 feet in length. However, there are some hoses that can reach up to 20 feet long or even a bit more. 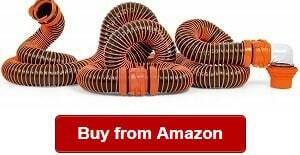 Q: What RV sewer hose accessories do you need? A: Although not necessary, you can add some sewer hose accessories to make things easier for you. One accessory you can add would be hose supports as they allow you to tilt your hose so that it can flow more consistently. Another useful accessory would be a macerator, which can be used for crushing the waste to make it easier for you to dispose of. Q: How to use (connect) RV sewer hose? A: Fortunately, it’s pretty easy to connect the sewer hose to the camper and the sewage system. Just make sure that you have some disposable gloves on because you’re going to deal with really dirty water. First, make sure that all the valves on the hose are closed. Once they’re closed, you can connect the sewer hose and the dump station opening and the tank. After that, open the black tank hose valve first. By doing this, you’ll feel pressure surging out of the tank. This will help drain out the black tank. Do the same to drain out the gray tank and close the valves. From here, everything’s already set up. If you want to use it, all you need to do is just connect the hose and the dump system again and drain out the tanks to the external sewage. Q: How to clean RV sewer hose? A: The best way to clean the hose is to flush it out completely and backwash it. You may also use some enzyme treatments to clean the inside so that it is completely clean. Also, you might want to make sure that the tank is fully clean as well because the tank might contaminate the hose even if the hose is clean. 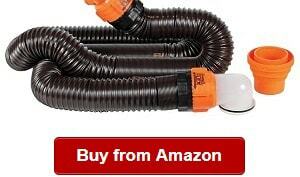 Q: How to store RV sewer hose? A: You can fold it and store it into your storage space in the camper. There are also hoses that can be compressed so if you have a small storage space, you can buy one of these compressible ones. Q: Camco revolution vs rhinoflex: what’s the difference? A: Rhinoflex RV sewer hoses are more well known for their ruggedness and durability. While they are a bit rigid, they’re extremely long lasting and even impact proof. They’re the type of hose that won’t get damaged even if you step on it. The Revolution Camco sewer hose, on the other hand, is known for its length and flexibility. Camco Revolution hoses are not as durable but they are not fragile either. The reach of these hoses are quite impressive and are good for people who need to have a distance away from the external sewage system. With the best RV sewer hose at your disposal, you’ll have a much easier time managing and dumping your waste. In fact, you won’t even need to worry about dumping anymore. The hose will allow you to simply dump your waste and wastewater to the sewage directly. No longer will you have to smell the foul stench of your wastes while you dig up a hole to store it in. Of course, you’ll need to have the best one for your camper otherwise you won’t be able to enjoy it to the fullest. This is why we’ve made a list of only top quality ones that you should use. With these, you’ll definitely have a nicer time during your camping trip because you won’t need to worry about all of that. 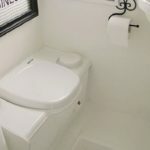 If you are looking for other RV waste water and sanitation products, you should read these articles: best RV holding tank treatments, best RV toilet papers, best RV portable waste tanks and best RV toilets. We hope you find them useful!